Stein’s presentation centered around a case study of one of his client’s using the Underwrite.ai technology to improve consumer credit underwriting. The firm was unnamed, but the lessons that can be learned from Stein’s presentation don’t need a name. They are legion. Since FICO is based on linear regression to build a credit scoring model, Stein said it isn’t accurate enough, nor does it go deep enough into consumer data to reach the more granular levels of a person’s financial situation. In that regard, then, the credit scoring system is due for an overhaul. That works as long as you limit your lending to the prime market. By screening out the population most likely to to default, lenders attempt to focus on good risk instead of bad. As a result of this credit scoring model, consumer lending is restricted to people with a history of consumer borrowing. Prime lending is subsidized by overcharging subprime borrowers because it divides the general population into three classes–people with access to cheap credit, people with access to expensive credit, and people with access to no credit. “Consumer Lending can’t be fixed with the current underwriting methodology,” Stein said. Why? Because consumer lending is an inherently non-linear problem. Therefore, lenders need to stop using a linear solution to solve this non-linear problem an migrate to a non-linear solution. That’s where artificial intelligence comes in. One question Stein often gets is, “Why not add more attributes?” But the problem, he said, is the basic math involved. That’s why Stein set out to build an online system where lenders can take online applications and apply a machine learning algorithm to them in real time to return a probability of a binary outcome. He said the key metric is the first payment default. “It’s a good proxy for overall payment default,” he said. If a borrower defaults on the first payment, chances that they will default on the loan are substantially higher. Underwrite.ai’s first client was a deep subprime unsecured installment loan lender who had a first payment default rate of 32.8%. Stein’s company built a non-linear model set using ensembles and reduced FPD to 22% in the first month. In the second month, it fell to 18%, then to 15% in the third month, and finally to 8.6% in the sixth month. 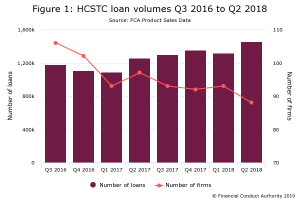 Stein was careful to point out that using artificial intelligence in consumer lending doesn’t exempt lenders from the Fair Credit Reporting Act. It’s still critical in the U.S. to offer an explanation for who is declined. It’s called an adverse action report. You have to say who’s being declined a loan and the reasons why. Artificial intelligence allows lenders to make loans to a larger segment of the population and at higher rates. It does this by getting enough detail in the marketplace to identify the danger zone more narrowly and specifically than the linear FICO credit scoring model. It’s all about the distribution of defaults. At 32.8% FPD distribution, Underwrite.ai applied an initial algorithm to cluster all the defaults at the bottom of the above chart (the area shaded all red). That represents the volume that can be discarded without a cost to the lender’s business. By identifying the 17% of loans at the bottom of the scale, Underwrite.ai can eliminate those loans with no negligible loss to the business. “Bad loans will harm you more than good loans can help you,” Stein said. Underwrite.ai is a solution that learns on its own. No one on Stein’s team adjusts rules manually for any lender. The company’s programmers wrote a model that determines what algorithm out of 64 will present the best efficacy in the intersection of a lender’s product with their customer base. Each time a customer makes a payment, or fails to make a payment, Underwrite’s robot asks the lender to send a unique identifier to the solution and the model re-trains. By using this non-linear model, Stein’s team can expand the range of input variables and understand the quantum effect in consumer lending with the collapse of the outcome of uncertainty. The potential is for lenders to make more money in the long run by identifying the highest risk populations more succinctly.